The change of the trend is obvious here. The sales had once recovered from the fall after the tax rise, but got into the downtrend again in Sep and Oct. This trend coincides with the fall of the residential investment in 3Q, and those facts suggest the downtrend hasn’t yet ended. 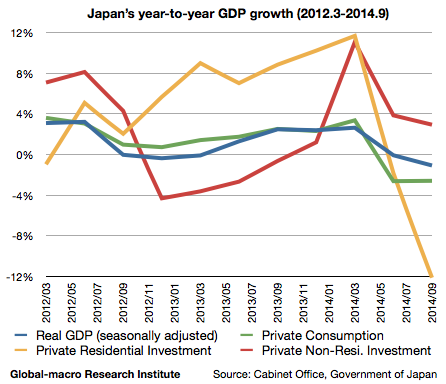 Abenomics is basically a combination of the QE and the public investment. The depreciation of the currency and the fuelled stock market as a result have promoted the consumption of the rich, who had the financial or foreign assets, but on the other hand the tax rise has an influence on all the nations. 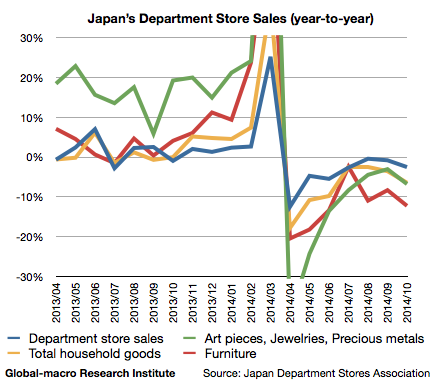 The decline of the sales in the department stores, which are normally used by the relatively affluent consumers, might indicate that the situation with the poor could be even worse. However, the current monetary and fiscal policies have no direct access to boost the consumption of the poor, and therefore it’s time to wonder what other strategies can save the situation. The most realistic plan is the income supplement. Although the most effective is the tax reduction, it’s highly unlikely that the government admits their mistake in that way. It’d be interesting if one of the other parties suggests the tax reduction, but even in that case it wouldn’t hinder the Liberal Democrats from winning. The investors must see if the government is to do anything other than the QE and the public investment, and otherwise they might need appropriate short selling along with their long positions, in order to hedge the risks of the decline of the private consumption. On the other hand, if they’re to plan the income supplement, there will be some stocks that are boosted by it.